I'm so excited to share the cutest math curriculum with you today. Masterbooks has recently released a whole line of elementary math. 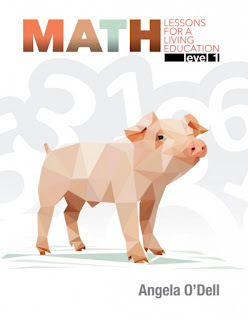 Math Lessons for a Living Education Level 1 is considered first grade or ages 5-7. We are using it for our five year old who is in kindergarten. This is our first real Math curriculum that we are using so to be honest I was a little worried about abilities. However this book is a very gentle approach. The author - Angela O'Dell - uses a story of twin siblings that you follow through out the book. As they learn about numbers so does your child. This is basically a living book approach to math. Masterbooks has laid out everything you need in the front of the book. They are famous for their fabulous schedules - where they tell you what to do on each day - this book is no exception with the schedule included in the front of the student text. There is a free downloadable answer key available online - but most likely as a parent you won't need that at this level. For manipulatives you are directed to make them ahead of starting the course. You are encouraged to use everyday type items like beans, index cards, glue, crayons - the full list is in the front of the book. There are a few sheets in the appendix you will need to laminate as well. Truly this is easy to implement and you can modify (use counting bears instead of beans if you have them) easily. This curriculum is designed to do over the course of a year and includes 180 days of work. Of course you can move at your own pace at anytime. This curriculum is so sweet. I just love the farm story of the twins. Maybe I might just love it a lot because we own chickens and they are a big part of our life but honestly I love the readings. So far we are a few weeks into the curriculum and we've been covering counting, writing numbers and some shape recognition. There has been lots of practice writing numbers but it is placed naturally throughout the workbook pages. At the end of the day this is a workbook, which is something my son loves to use for school. There has been times to color and I can see that will happen often throughout the book. The binding of the book allows for you to tear out pages which is very helpful as this book is over 350 pages. The bright colorful pages are very appealing to the eye and we've loved the farm theme of the story and worksheets. I think this is the perfect start for math education. As a kindergartener it is a good fit for my student. Visit Masterbooks.com for additional information. These math books look like so much fun! I think level 1 will be perfect for my soon-to-be 6 year old. Thank you for the review. It was very helpful.